Barneys style #: 500210587 Malin+Goetz Intensive Hair Mask - 4 oz. $25.00 : This intensive hair mask scientifically blends essential fatty acids with natural plant extracts and wheat amino acid proteins to restore dry, damaged, and chemically processed hair. Effective for all hair and scalp types, this fortifying treatment helps replenish moisture and repair damage for advanced, residue-free conditioning and detangling. Nutrient-rich grapeseed helps strengthen and protect while meadow foam seed nourishes, leaving hair soft, shiny, and healthy. Natural fragrance and color. Easily integrates into daily maintenance and prevention regimen. 4 oz. 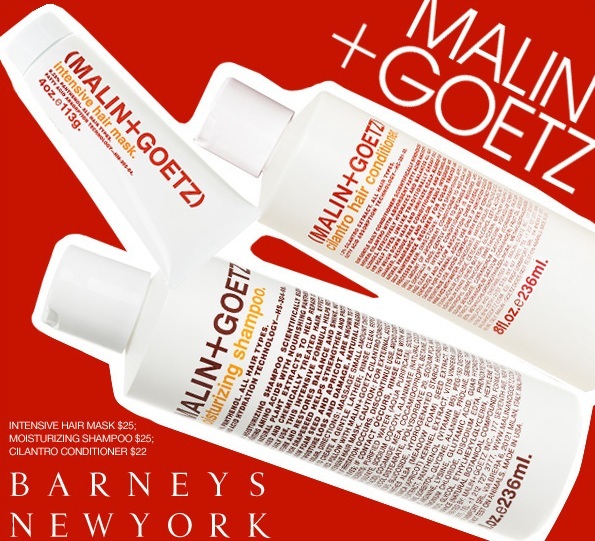 Barneys style #: 500210107 Malin+Goetz Moisturizing Shampoo - 8 oz. $25.00 This Moisturizing Shampoo scientifically blends hydrating amino acids with nourishing panthenol and natural plant extracts to gently cleanse, condition and repair dry, damaged and chemically treated hair. Effective for daily use on all hair and scalp types, this intensive formula helps retain moisture and restore balance and shine. Nutrient rich grapeseed helps strengthen and protect while meadow foam seed and apricot are known to prevent moisture loss and damage. Natural fragrance blend and color. Easily integrates into daily maintenance and prevention regimen. 8 oz. Above are only a few of the amazing hair care products you will find at Barneys.